Magic is the manipulation of forces in the universe through rituals, incantations, or sheer willpower. From the sorcerer transporting across realms to the warrior wielding enchanted weapons, there are a variety of ways that magic manifests itself. The three major spheres of magic are Elemental, Spiritual, and Mental. Each sphere draws its power from a different source: the unceasing conflict between the elements that shapes the natural world, the powers shared by the spirits and deities of Elanthia with their followers, and the innate psychic energies of the mind. The most powerful applications of magical power are known as flow magic, requiring very rare skill and knowledge. By comparison, rote magic that has been repeatedly practiced and codified is much more commonly seen and used. Spell circles are collections of rote incantations, known as spells, designed to evoke specific changes in the world. 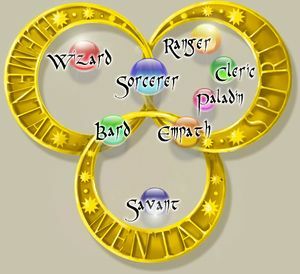 Each spell circle belongs to at least one of the spheres, and there are hybrid circles that mix two of the spheres. Each individual spell has a spell number which consists of a reference to the circle it belongs to and the rank of the spell within that circle. For example, the spell Minor Shock has the spell number 901, because it is the 1st spell of the Wizard spell circle and all Wizard spells have a '9' prefix. (For this reason, the Wizard spell circle is commonly referred to as the '900s'.) Each spell also has a mnemonic phrase that may optionally aid in casting it: for example, for the aforementioned Minor Shock spell, the mnemonic is 'MINORSHOCK'. Every adventurer can research spells, but they are limited by their profession in which spell circles they have access to. To learn a spell, one must train in one of the profession's available spell circles. Each skill rank in a spell circle gives access to additional spells, up to the character's level. For example, a level 6 Wizard with 5 ranks in Minor Elemental (400s) and 7 ranks in Wizard Base (900s) will be able to cast spells 401 through 405, as well as 901 through 906, but not 406 (because rank is not high enough) or 907 (because level is not high enough). In addition, all pure spellcasting professions (Cleric, Empath, Sorcerer, Wizard) innately know the spell Arcane Blast (1700). To cast a spell, one must first have learned it by training in the appropriate spell circle. The list of known spells can be viewed with SPELL ALL. One must also be able to harness enough magical energy, known as mana. The more powerful a spell, the more mana that must be harnessed to use it. Increasing one's mana is achieved by training in Harness Power. Attempting to cast a spell without sufficient mana can cause injury or death. There are two ways to cast: either by preparing it ahead of time then casting, or by incanting it spontaneously. Use the PREPARE verb with the spell number, mnemonic, or full spell name to ready the spell. For example, a wizard can PREPARE 901, PREPARE MINORSHOCK, or PREPARE MINOR SHOCK to ready the Minor Shock (901) spell. The spell will stay prepared for 30 seconds or until using the CAST verb at a viable target, for example: CAST RODENT. Using CAST without a target will, by default, cast the spell back at the caster. Be careful not to do this with offensive spells. To cancel a readied spell without casting it, use the RELEASE verb. Some offensive spells have a CHANNEL mode that may deal additional damage. Some spells have a secondary use that may be accessed using EVOKE. The INCANT verb prepares and casts a spell in a single action. For example, INCANT 901 or INCANT MINORSHOCK to prepare and cast Minor Shock. INCANT automatically selects a target, unless the target has been set with the TARGET verb. It is possible to incant a spell with the channel or evoke styles: INCANT 1700 EVOKE. See the INCANT article for more details. Spells used directly in combat can have effects based on several different combat resolution systems. Bolt spells produce magical projectiles, such as a fireball or a bolt of lightning. An attack roll is made to determine whether a bolt spell hits or misses. You hurl a powerful lightning bolt at a shadow mare! Attack strength (AS) is primarily determined by the caster's stance and Spell Aiming skill. Defense strength (DS) is primarily determined by the target's stance and general ability to dodge or block ranged attacks. Attack-vs-Defense (AvD) is determined by how well the target's armor protects from the specific type of bolt. d100 is a random number from 1 to 100. If these factors add up to a number greater than 100, then the attack hits. Warding spells directly focus on the target, attempting to breach its magical defenses. A warding roll is made to determine whether a warding spell successfully affects the target. You gesture at a krolvin warfarer. A dull grey beam snakes out toward the krolvin warfarer! ... 80 points of damage! Casting strength (CS) is primarily determined by the caster's level and Spell Research. Target defense (TD) is primarily determined by the target's level and defensive magics. Cast-vs-Armor (CvA) is determined by how well the target's armor generally protects against spells. If these factors add up to a number greater than 100, then the spell will affect the target. There is a 1% chance when casting any attack spell that the caster will fumble and fail to cast it properly. You gesture at a raving lunatic. Wearing heavier armors can interfere with casting and cause spells to fail. The chance can be reduced with training in Armor Use. Spells and other enchantments are often embedded into various items that can be found as treasure or created by skilled artificers. Common magic items include a number of types of wands, as well as the commonly found items in the treasure system such as small statues, white crystals, black crystals and ruby amulets. Occasionally one finds items in the treasure system that are magic items. Brooches, statues, rings, and buckles are examples of some that may be found. These may contain spells already, or may be able to have a spell imbedded into them using Magic Item Creation (420). Additionally, some of these may be able to be recharged by a wizard using the Charge Item (517) spell. The spells found in these items generally will not exceed 20th level spells, and certain spells (such as Call Familiar (920)) will not be found in such items. Some professions create magic items. Rangers can create rods, amulets, and wands which may be imbedded by any other profession capable of learning the Magic Item Creation (420) spell. Wizards can enchant weapons and armor to make them more effective in combat, and sorcerers are capable of creating crimson salt crystals that can be used to animate dead creatures or characters. Gems that have been properly purified, or are simply previously orb gems are magic items, and may have spells imbedded them using Magic Item Creation (420) if treated with a grot t'kel potion; additionally, they may be turned into orbs for use with the Charge Item (517) spell or treated with the Holy Receptacle (325) spell that can bless deity powers into gems. Scrolls are printed materials with the magic of one or more spells written upon them. Success with scrolls is increased with training in Arcane Symbols. This page was last modified on 21 July 2017, at 23:46.